I’m four films into the process of indoctrinating our five-year-old to the Star Wars universe, and it’s safe to say at this point that we’ve got a fan on our hands. There have been a few course corrections; I wanted to go the Machete route of IV-V-(optional)I-II-III-VI, thinking I’d be telling the most complete story at the expense of my own enjoyment, but our little guy was so stressed over poor Han’s situation at the end of Empire that we pushed straight into Jedi to see how that all shook out. It was the right move. Jabba’s barge, man. We’re in prequel territory now, and I have to say that watching it through his eyes makes this experience the most I’ve ever liked these films. He already prefers the Original Trilogy, even at five, but he’s nevertheless ALL-IN for a young Obi-Wan. Although I’m enjoying myself I’m also pining for the OT and maybe that’s why this post is happening when it’s happening. Oh also there’s a new Star Wars movie out and maybe that’s contributing. 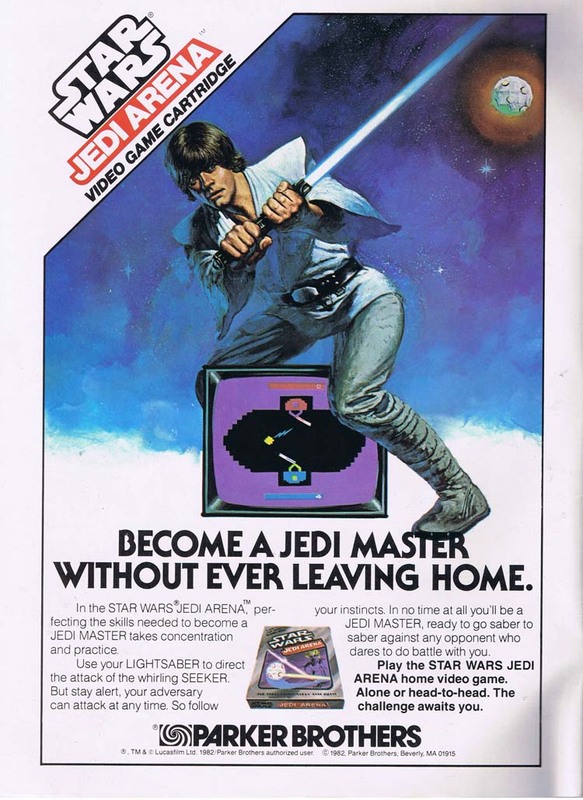 The Atari 2600’s heyday and Star Wars fever almost perfectly overlap each other in their timelines, and when you factor in Star Wars’ penchant for merchandising you’ve got a real gold mine of entertainment on your hands. And money, too, a gold mine of money. It would have been enough for these games to represent Star Wars, they’d probably have been almost if not as profitable regardless, but they were actually pretty decent games. And they were marketed beautifully. That box art above is misleading; I’m only going to talk about the released titles and not the scrapped Return of the Jedi games. What better representation of The Empire Strikes Back is there than the opportunity to re-create a single element of the Battle of Hoth that involves an Airspeeder against an AT-AT? It’s actually a solid game, if limited in scope. The commercial for this one is quick and dirty, only fifteen seconds long, and was paired with a Frogger ad for maximum Parker Brothers’ reach. It’s still an exciting spot. Jedi Arena feels like a weird sort of “what-if?” territory for the Star Wars narrative, a training exercise for padawans that exists probably post-Jedi but maybe existed back in the prequel days but is never really a thing that can happen during the Original Trilogy even though there’s a Seeker ball in Episode IV but only one person battles it and also does it matter and why am I trying to timestamp it? It’s a simple two-player battle game with a really intriguing promise for a kid wanting to get further into the Star Wars universe. It’s a simple premise, even simpler than the Empire Strikes Back game, but it works and looks pretty great for what it is. The ad does a good job of shrouding their Luke Skywalker-lookalike (Luke-alike? Sorry) in enough ambiguity that at a glance it appears that Mark Hamill is in that Jedi training seat. 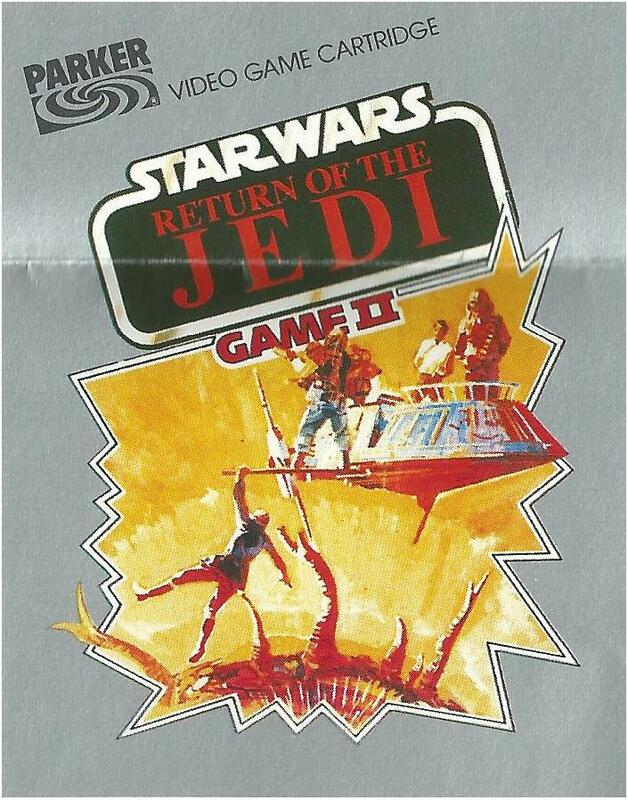 The official Return of the Jedi title was Return of the Jedi: Death Star Battle, and was the one Atari title to release in the same window of the movie. 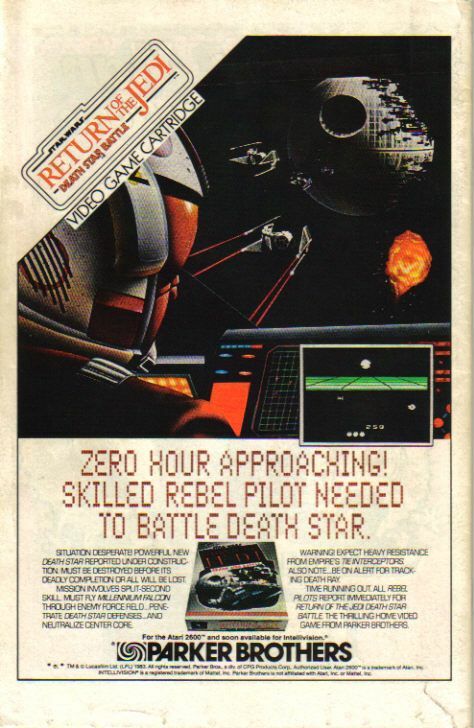 Your task is to chip away at the Death Star in an almost-Arkanoid-fashion, and it looks great. This is a beautiful game with a great ad. It seems out of order to place here, but the last 2600 Star Wars title is for the port of the Arcade game. 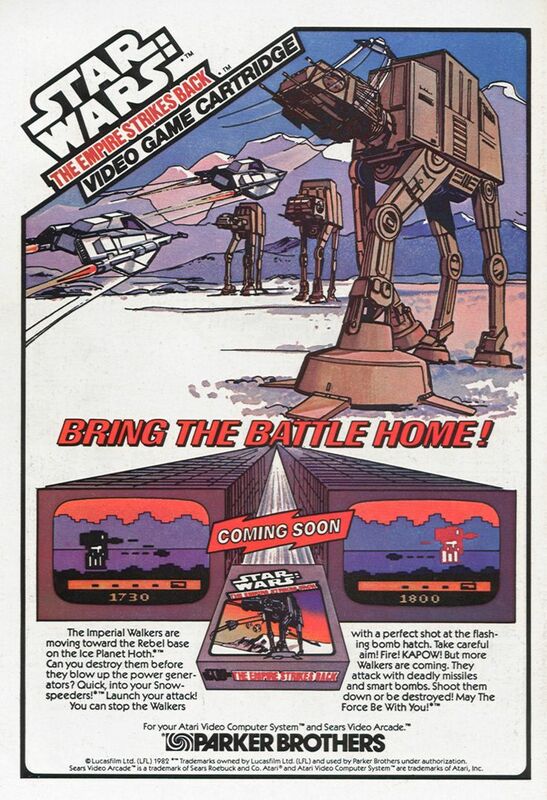 This game is personally significant; the cabinets were at a nearby YMCA and a skating rink where I grew up and I spent way too many quarters trying to live inside the vector beauty that was the Battle of Yavin. Seeing this ad gives me chills from the sheer presence of that vector-based gameplay, in spite of how aggressively extreme the ad itself is . 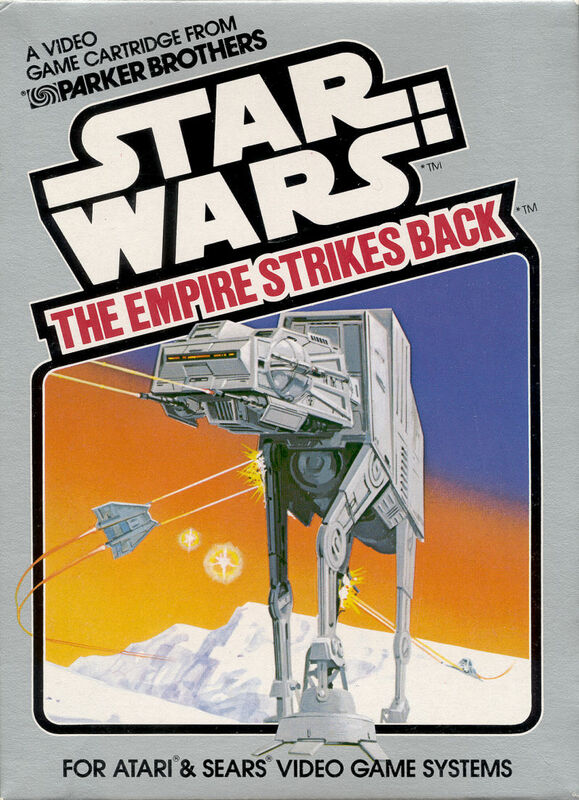 There are other Star Wars games, of course, and there are better Star Wars games, too. Dark Forces, Rebel Assault, the NES titles, and the Battlefront series (even the recent one, post-updates) are amazing experiences. 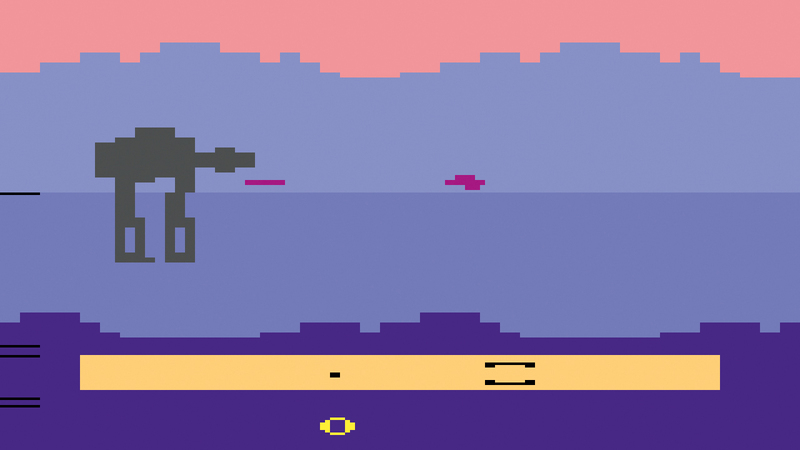 Still, there’s something to be said about that early ’80s period where both this franchise and the enthusiasm around this franchise were something that was still new to the world, something that nobody had really seen before, and these games are really reflective of where the technology, the industry, and the fandom were at this moment. Really, really special.